Disney to release 3D Blu-rays next Autumn? | What Hi-Fi? Disney to release 3D Blu-rays next Autumn? That was the message from Walt Disney Studios Home Entertainment bosses at D23, the company's first-ever fan conference, which has just wrapped up in California. At the conference, attendees were able to see 3D clips from upcoming Disney releases, including the new version of A Christmas Carol starring Jim Carrey, due in cinemas this October. 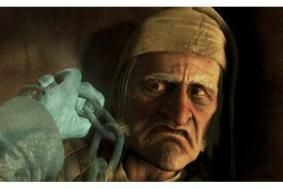 Directed by Robert Zemeckis, the new animated film uses similar techniques to The Polar Express, and sees Carrey playing not only Ebenezer Scrooge, but also all the ghosts. Disney showed the clips on a 3D-enabled Panasonic Blu-ray player and TV, and confirmed that it wouldn't be following the easy route of making lesser 3D versions using simple colour-filtered glasses, as these give results inferior to those available in cinemas. At the moment it's holding back from releasing 3D Blu-rays of existing cinema releases for exactly this reason. The demonstration was encoded with a new version of the AVC codec, called AVC Multi-View Codec, or AVC-MVC. The Blu-ray Disc Association expects to create a standard specification for 3D releases by the end of this year, paving the way for hardware and movie releases in 2010. A major problem has been finding a way to cram all the data required for a full-length 3D movie into the maximum 50GB capacity on current Blu-ray discs. There has also been some discussion of engineering advanced 3D for standard definition DVD releases, but it seems Disney is concentrating its efforts on Blu-ray, supporting those hardware manufacturers already planning 3D product launches next year. Other Disney titles due on the big screen in 3D next year, and thought likely to be available in 3D on Blu-ray in time for the 2010 Christmas season, include Tim Burton's Alice in Wonderland – with an all-star cast including Johnny Depp, Helena Bonham-Carter, Anne Hathaway, Michael Sheen, Alan Rickman and Stephen Fry (as The Cheshire Cat!) – and Toy Story 3.